Posted April 23rd, 2014 by Hoffy Cycles. The casual rider may be able to get by with their existing footwear when riding, but for the more serious cyclist, the right pair of shoes can make a huge difference to their comfort and performance on the road. Riding in dedicated cycling shoes can not only enhance the riding experience, they also come in a range of styles and for different riding purposes. Hoffy Cycles explain more in this about how to buy the right shoes for cycling in this post. As their name suggests, road shoes are best used for riding only and can easily be damaged and can be awkward to walk in. 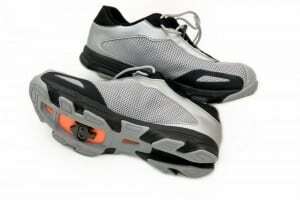 They are constructed with the thinnest soles and are very lightweight. Their stiff soles and inability to flex give them the ability to transfer greater power the pedals. What do road shoes offer? Most offer a two or three hole cleat system on the soles to lock in with clip free pedals. Make sure that you buy the right shoes that match your pedals. Built for off road riding on a tough sole for rugged terrain, mountain biking shoes are able to be worn on the ground when you need to push or shoulder your bike. They have a more padded sole than road shoes. They have recessed cleats which makes for easy walking and good tread for rocky, loose or unstable surfaces. Like all shoes, a good fit is extremely important. Make sure the width of the shoe is wide enough to accommodate the widest part of the foot and there is no pressure placed on the foot. Over a long ride a shoe that is not wide enough can become very painful as feet can expand over a long ride. All specialised cycling shoes should have a stiff sole to reduce energy lost between the foot and the pedal. This differs from running shoes which normally have a flexible sole. When feet begin to sweat, a breathable material in the shoe can draw moisture away from the foot and help prevent the foot slipping in the shoe. Fastening the shoes – Laces or Straps? While laces offer the most customisable fit and comfort, they need to be tucked away to prevent them being caught in the chain. Straps can be convenient for fast closure and the more straps the more customisable the fit and how it can be adjusted. When it comes to cycling shoes you do get what you pay for, we always encourage people to try the shoes with socks that you would wear while riding. A snug fit is important, but not so it the foot is too restricted. Call into Hoffy Cycles one of Brisbane’s longest established bike shops for the full range of top brand bikes and accessories, including our range of cycling helmets and cycling footwear.